A delegation of CBF staff and leaders are gathering this week in Durban, South Africa for the World Congress of the Baptist World Alliance. The following press release comes from CBF partner Baptist World Alliance. Durban, South Africa (BWA) — Ngwedla Paul Msiza of South Africa was installed as the second African to be president of the Baptist World Alliance (BWA), the global organization for Baptist Christians. 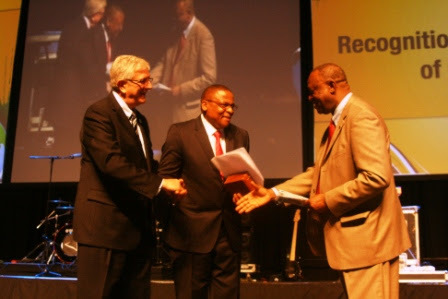 The ceremony took place on July 25 during the Baptist World Congress in Durban, South Africa. Msiza succeeds John Upton of the United States, and is the first African to hold the office since William Tolbert of Liberia served as president of the BWA from 1965-1970. Tolbert was later elected president of Liberal in 1971 until he was overthrown and assassinated in a military coup in 1980. A BWA vice president from 2010-2015, Msiza has been actively involved in the BWA since 2000, serving on its governing bodies and several key committees and commissions. Msiza was president of the All Africa Baptist Fellowship, one of six regional fellowships of the BWA, from 2006-2011 and general secretary of the Baptist Convention of South Africa (BCSA) from 2001-2010. He chaired the Local Arrangements Committee for the 2015 congress meeting in Durban. In his response, Msiza, in alluding to the congress theme, “Jesus Christ, the Door,” declared that the church ought to swing the door wide open for those who would come to Christ, rather than acting as doorkeepers, deciding who are to be admitted and who to keep out. As doorkeepers, some install locks that “only they can open.” Contrary to such notions, Jesus Christ, the door, is inviting us, which affords us an ongoing opportunity for entry. Msiza was trained at the Hebron Teacher Training College and worked bi-vocationally as a pastor and school teacher from 1988 until he became founding principal of the Baptist Convention College in 1995, from where he left to become BCSA general secretary. He holds diplomas and degrees from the University of Witwatersrand, the University of South Africa, the Baptist Theological Seminary of Southern Africa and the Baptist Bible Institute. He pastors Peniel-Salem Baptist Church in Pretoria beginning in 2011. He has been married to Sanna Mapula since 1986 and they have three sons. Twelve vice presidents were also installed along with Msiza. They are Michael Okwakol, Uganda; Ernest Adu-Gyamfi, Ghana; Tapan Chowdhury, Bangladesh; Miyon Chung, Australia; Anslem Warrick, Trinidad and Tobago; Jules Casseus, Haiti; Dimitrina Oprenova, Bulgaria; Jan Saethre, Norway; Naomi Tyler-Lloyd and Jerry Carlisle of the United States; Jorge Quinteros, Chile; and Luiz Roberto Silvado, Brazil. Saethre of Norway will serve as first vice president. The new slate of leaders serves until the next global gathering of Baptists in Rio de Janeiro, Brazil, in 2020.